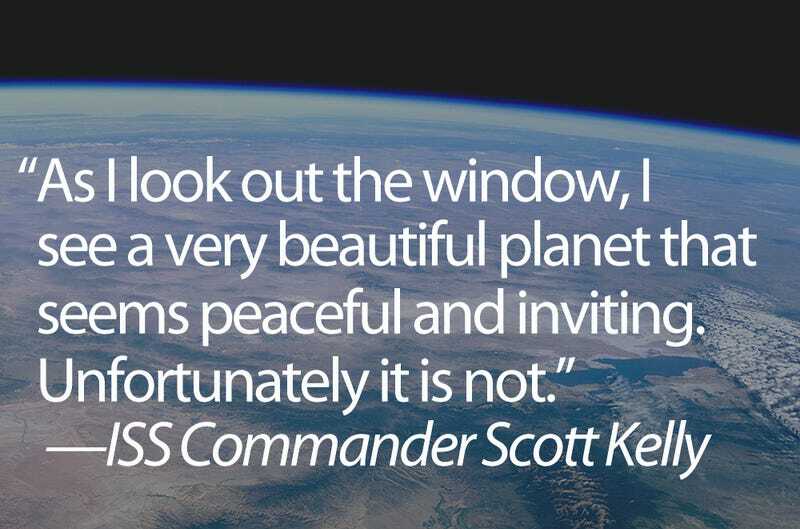 ISS Commander Scott Kelly, who happens to be the brother-in-law of Gabrielle Giffords, the U.S. Congresswoman who was shot Saturday in Arizona, recently led a tribute to the victims, lamenting that the planet he observed wasn't a more peaceful one. As I look out the window, I see a very beautiful planet that seems very inviting and peaceful...Unfortunately, it is not. These days, we are constantly reminded of the unspeakable acts of violence and damage we can inflict upon one another, not just with our actions but also with our irresponsible words.